A colleague of ICICI Bank CEO Chanda Kochhar says she is so capable that she could even command an army. Dressed in a deep pink bandhni sari, her hair impeccable as usual, she walks in for the meeting tall and straight, with an easy air of confidence. Her colleagues say that every minute of her day is accounted for, from the time it takes her to walk to the lift, to the time she spends with investors, clients, colleagues, and even the occasional journalist. Chanda Kochhar, Managing Director and CEO of ICICI Bank, India's largest private sector bank, could even "command an army", according to its Chief Human Resources Officer, N. Ramkumar, who has worked with her for 10 years. ICICI Bank head Chanda Kochhar says the award pushes her to work harder. 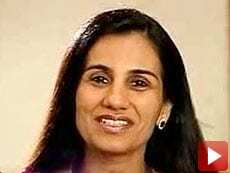 Kochhar joined ICICI in 1984 as a management trainee. She was 22, and ICICI was still the Industrial Credit & Investment Corporation of India (ICICI Bank was formed in 1994). The man who hired her, Managing Director and CEO K.V. Kamath, remembers being impressed by her focus. For Kochhar, making inroads in a maledominated field was a challenge. ICICI was then a development finance institution that lent to companies. "It was not easy to visit a factory," she says. "There was a lot of social pressure - people didn't expect a young girl could check machines." Sitting in her functional yet elegant office in Mumbai's Bandra-Kurla Complex, the hub of the financial services industry, she talks about the values she grew up with: integrity and perfection. These are just two of the attributes that have made her one of the country's most capable business leaders. Kochhar's achievement is all the more remarkable, considering her father died when she was 13. Three years later, the family moved from Jaipur to Mumbai. Years later, as a hard-nosed banker, she would buy one of the largest banks in her home state - the Bank of Rajasthan. Despite 30 years in Mumbai, she cherishes her Rajasthani heritage, as her bandhni sari suggests. What drives her steely determination to get what she wants? She says: "My passion lies in the pursuit of excellence - can I do it very well, better than others?" Kamath recalls the time when Kochhar was given charge of corporate banking, in 1993. "This was the first time ICICI had to meet clients. She set up, for the first time, client relationships. And the annual target I had set, she achieved in the first quarter." For the seemingly conservative Kochhar, the climb to the CEO's office was arduous. Not only did she fight one of the toughest succession battles in corporate India, she also steered the bank through one of the biggest downturns in recent history, taking the helm in May 2009. Chief Financial Officer N.S. Kannan, an old-timer at the bank, points out that the 2008 global financial crisis led to a Rs1,050-crore decline in ICICI Bank's profit after tax for 2008/09. In December 2008, Kochhar, then Joint Managing Director and group CFO, was named Kamath's successor. "She did not lose her composure for even a day," says Kannan. Kochhar, who says she believes in "recognising challenge in its entirety, and taking it head on", led a quick turnaround. She consulted her core team and worked out a new strategy. The 4C strategy - cost, credit, CASA (current account and saving account) ratio, and capital - marked a significant shift from ICICI Bank's strategy of powering its growth with retail loans. Within a few months of taking up the top job, she managed to get the board's approval for the strategy without much trouble. The decision-making process was democratic, and after the strategy was finalised, it was explained to every employee. Kochhar's first big step as CEO worked. The bank reported a 30 per cent jump in profit for the first quarter of 2011/12, and expects to maintain its net interest margin - a key measure of profitability - at 2.6 per cent for the year. At a time when most lenders have reported a drop in interest margins, Kochhar's script has played out on cue. Her colleagues say she wastes no time in taking crucial decisions - she decides and gets on with the job. 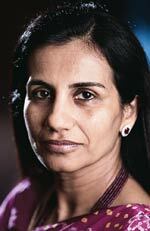 In 2000, Kochhar, who was only 36 then, was asked to move out of corporate banking - which she had built into a big revenue earner - to head the fledgling retail division. Kamath, who recommended her for the job, says she was concerned about her own lack of retail banking experience, and needed some convincing. And although it was a tough decision, she took only a day to make it. Soon after she took charge of the retail business, it became a leader in its segment. She says matter-of-factly: "New tasks will be unknown. You learn, grow and evolve." Kochhar has balanced family and work for three decades. "You often feel as if you are walking a tightrope," she says. "Demands do not go up or down - they are constantly there. Often, you feel you are doing too much." An intensely private person, she has just one family memento in her office - a framed painting by her daughter Aarti Kochhar. Her eyes light up, and her businesslike demeanour vanishes briefly, as she says: "My daughter is extremely proud of me."